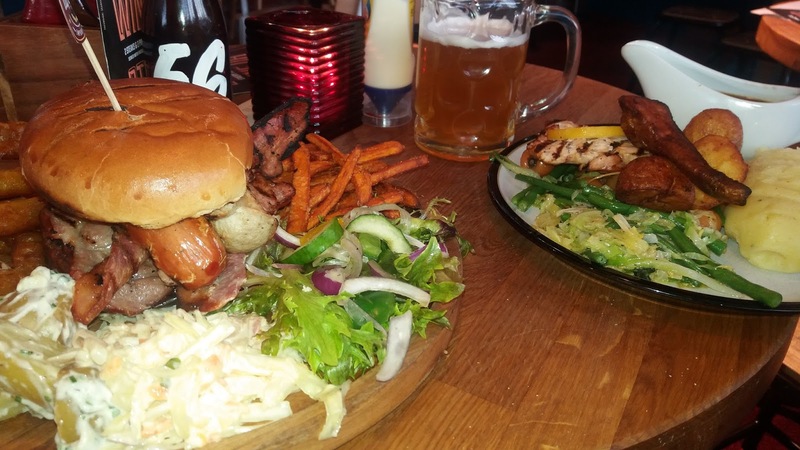 Mansfield's Tap Haus has been on our list of places to visit for some time. We even tried to use the Nottingham Food Lovers name to try and get a reservation on opening weekend without joy. We've popped in for a drink on a few occasions as it's one of the few local places in the Mansfield area we can get great Continental Beers on tap including the likes of Erdinger and Kozel. Since it's opened we've heard mixed reports regarding the food with friends leaving before even being served on the opening night and a look on the likes of Tripadvisor gives a very varied impression but after a hard day cycling and running in the Peak District we desperately needed food and with our usual go-to for pub food having had a record breaking day leading to them running out of meat our next closest option was Tap Haus. We can't always set our stall our to head somewhere for a food review but on this occasion circumstances worked in our favour. The menu at Tap Haus as the name suggests is very German orientated. Not something you'll usually see unless you venture to the Christmas German Market in Nottingham. There's something pretty comforting about a big Bockwurst or Bratwurst in Market Square amongst the Christmas lights so would Tap Haus have that sparkle.? I ordered the Die Zugspitze Burger. 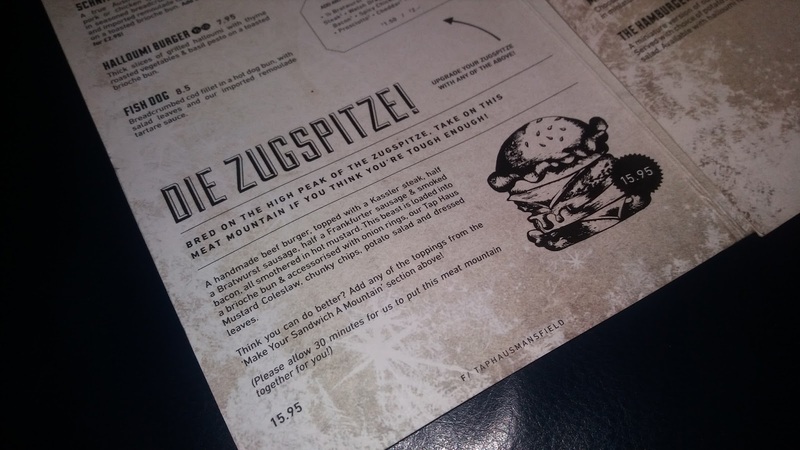 Named after Germany's highest peak which rises to 2,962 metres above sea level so you can get the idea that it's going to be a pretty size able burger. 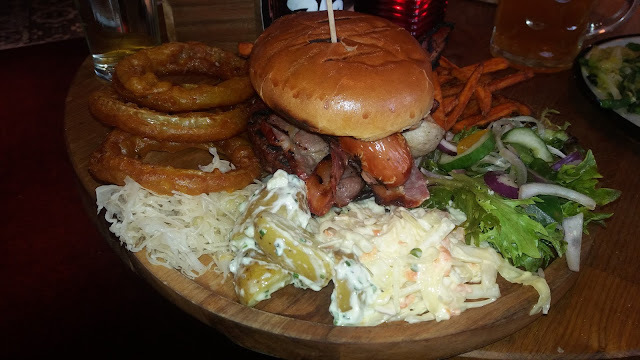 Featuring a pretty big beef patty (I'd say half a pound at least) topped with thin cut Kessler Steak, Half a Bratwurst, Half a Frankfurter Sausage and smoked bacon. 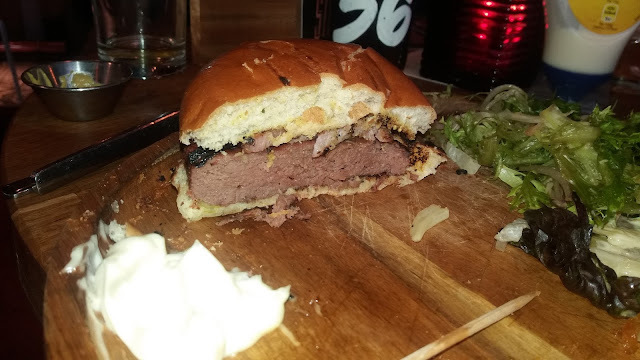 It said on the menu above it was supposed to come out all smothered with hot mustard but sadly the chef missed that off my burger. I really love my mustard too so wasn't particularly happy. If you order a mixed grill usually the Zugspitze has to be Tap Haus own version of the mixed grill and it was sehr gut (I can remember that from GCSE German). The patty itself was beautifully moist and full of flavour. Well worth trying for yourselves. At £15.99 it's a shade expensive by Mansfield standards but I'd happily order again. Now that's a meaty burger.